There are several dozen varieties of rice. Some of the common varieties of rice include jasmine, Texmati, Calmati, Japanese, arboria, brown rice, wild rice and basmati rice According to ayurveda, basmati rice is the king of all rices. Basmati rice is sattvic, or pure; it balances all three doshas; it is nourishing for the body tissues; and it is easy to digest. Aged basmati rice has an aroma and flavor arguably the best in the world. Ayurveda recommends avoiding rice that is parboiled, instant or pre-cooked because is has less nutrition and less prana, or life energy, in it. 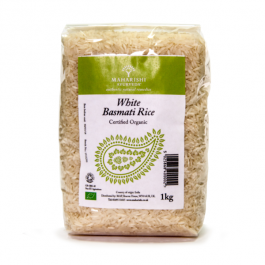 Wholegrain organic brown basmati rice is known for its wonderfully nutty flavour and distinctive texture. Many people are nervous about cooking wholegrain rice, but actually it’s as simple as cooking white rice or pasta – and it only takes 25 minutes. As well as being easy to prepare, Maharishi AyurVeda Punjabi Brown Basmati is the classic grain with all the natural goodness of the bran layer intact, making this a nutritional addition to your healthy lifestyle. It’s rich in nutrients, packed with natural fibre, and has a low to medium GI – which means it keeps you fuller for longer. The wholesome nutty flavor of wholegrain rice makes it the perfect accompaniment to soups, salads and strong, spicy dishes. 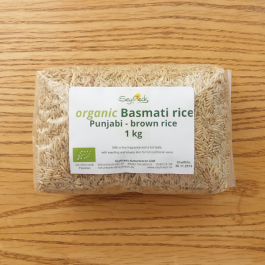 Punjabi Organic Brown Basmati rice is a good source of complex carbohydrates and fiber and also contains some protein and small amounts of magnesium, phosphorus, thiamin and niacin. A 1/2-cup serving of cooked brown rice contains 108 calories, 1 g fat, 0 mg cholesterol, 22 g carbohydrate, 2 g protein, 2 g fiber, 5 mg sodium and 77 mg potassium. 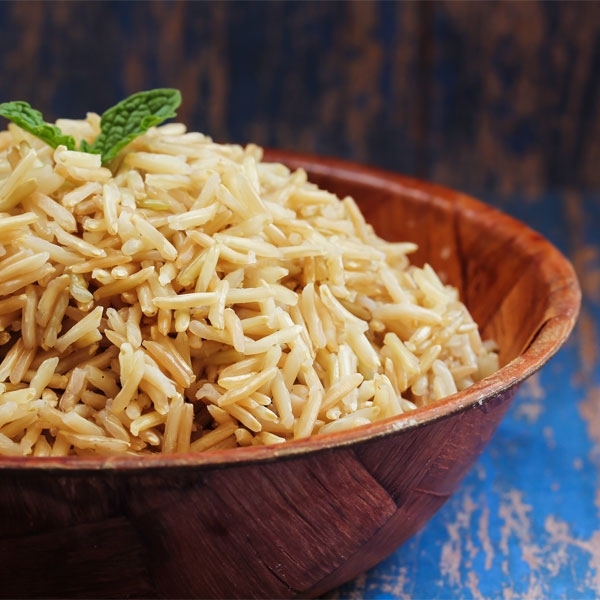 Wholegrain brown basmati rice is known for its wonderfully nutty flavour and distinctive texture. Maharishi AyurVeda Punjabi Brown Basmati is the classic grain with all the natural goodness of the bran layer intact, making this a nutritional addition to your healthy lifestyle. 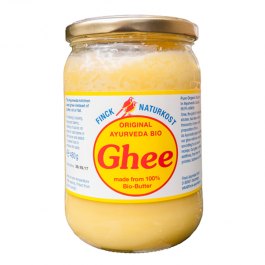 It’s rich in nutrients, packed with natural fibre, and has a low to medium GI – which means it keeps you fuller for longer. The wholesome nutty flavor of wholegrain rice makes it the perfect accompaniment to soups, salads and strong, spicy dishes. Basmati Punjabi Brown Rice - 1kg pack. Our basmati rice has a naturally occurring Arsenic lower than 0.04 mg/kg and is thus safe for regular use by both adults and children.